I mean, how else is everyone supposed to know where to sit after we got rid of the table under which I had written everyone's names at their appropriate seat? It always gets brought up how, because I'm such a picky eater, there is next to nothing on my plate when I get to the table. Turkey, mashed potatoes, green beans, and bread. Done. 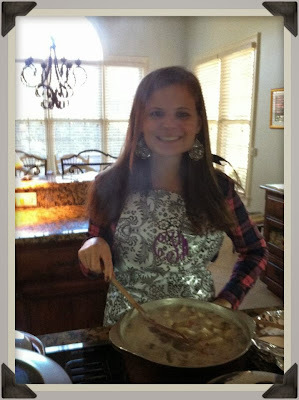 & the best part is that I unnecessarily wear an apron while cooking them just because it's cute and monogrammed. 1. Wash, peel, and chop the entire bag of potatoes. Leave as much skin as possible on the potato. 2. Add potatoes, water, & salt to a pot on the stove and bring it to a boil. Let it boil for about 20 minutes until potatoes are fork tender. 3. Pour the entire pot into a strainer, let the water drain out, and return potatoes to the pot. 4. Add in sour cream & butter. Mash with a potato masher. 5. Add in salt & pepper to taste. Mash with a potato masher. 7. Spoon potatoes into an oven safe dish, top with the shredded cheese, and place in the oven on 350 until the cheese has melted. Yum!! I'm a huge mashed potato fan, and its one of the few things my picky husband eats on Thanksgiving too, so you're not alone! Thanks so much for joining the link-up! :) Also I'm pretty much obsessed with that monogrammed apron!! I love mashed potatoes but have never had red skinned ones before! I love that you leave the skin on too!